So guys, there soon will be "antimatter delivery service" (something like pizza delivery). Fastinating world we live in, don't we? Any ideas for experiments you would do with your pizza... eh, sorry, antimatter? I still find pair production fascinating, as a way of 'producing' antimatter. That antimatter scene was excellent IMO. Does make me wonder. I liked it as well. Anyway his books are awesome and Tom Hanks as prof. Langdon is also great. Like he was born for this role IMO. 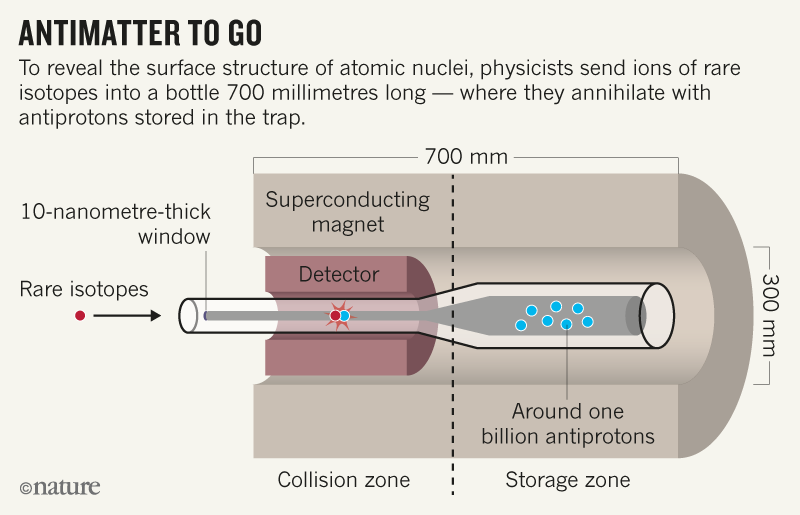 Trapping and keeping antimatter for more than short periods has always been a problem. According to this article the break out period will be in four years. Even though a billion positrons sounds like a lot, it is still incredibly small. It is funny the way screen writers use antimatter as a device for a bomb. They always lose me as this is simply not possible. Hope they are successful in trapping and transporting the billion in fours years. Nice find, Radim. That's a totally interesting project. It is funny the way screen writers use antimatter as a device for a bomb. They always lose me as this is simply not possible. It depends on what your definition of a bomb is i guess. Any system that traps antimatter is potentially a bomb, which would be fired when the containment mechanism is compromised (such as loss of power to electomagnets etc). The size of the explosion would proportional with the amount of antimatter trapped and in current systems is more like a very small firecracker than what someone would call a bomb. It all starts somewhere, a bigger particle collider, better methods, automated production running around the clock, virtually nothing is impossible in the long run. Watching star trek as a child and seeing their flip open hand communicators, thinking that's impossible to have a transmitter and receiver in a HH and the batteries would fill a backpack LOL, it was laughable, and now with a camera, hell an entire television studio in your pocket phone, yet here they are, it was not impossible. It would not be very efficient to build antimatter weapons if you wanted to get the biggest possible bang out of a weapon. If you look at the biggest nukes like the Tsar bomba the power unleashed is comparable to letting a full kilogram of antimatter meat a kilogram of matter. The thing does weigh in at 25 tons in total though, but i doubt you could make a containment system that holds a kilogram of matter any lighter than that... and you'd still have the risk of it going off in your face if you ever lose containment for whatever reason: a hydrogen bomb will usually -not- go off if something fails, and antimatter bomb is very likely to go off when -anything- fails.